We love the amount of bait in this container and the overall success rate. With an appealing lure and an excellent price, this comes in as our runner-up. As a natural food source for gophers, these peanuts are sure to entice them and rid them from your lawn. Gophers, or more technically “pocket gophers”, can create damage on your property ranging from torn up sod to destruction of roots to shrubs and tree (eventually killing them), and even gnawed on tubes or wires. This can not only be frustrating but cost several hundred or even thousands of dollars in loss. Gopher damage is often confused with the work of moles. However, the difference can be discerned by their dirt mounds and tunnel visibility. Gopher mounds are more oblong and crescent-shaped, whereas molehills are almost always more symmetrical. Gophers do not make visible runs or lines in yards, as moles do. Pocket gophers are only found within the Western Hemisphere but run rampant in the United States. So, we’ve collected the best gopher poisons this year and reviewed each of them. 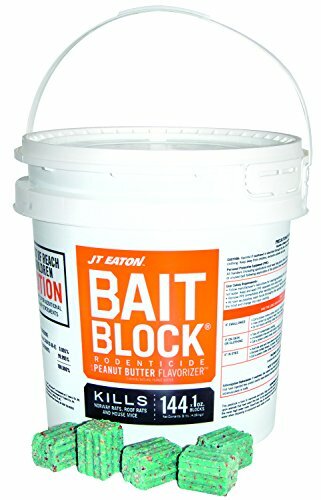 JT Eaton 709-PN Bait Block is an anticoagulant bait block in brick designed to attract and eliminate mice and rats. The active ingredient is diphacinone at 0.005 percent. This ingredient is created and proven to eliminate smaller rodents and pests in only a few days within feeding. 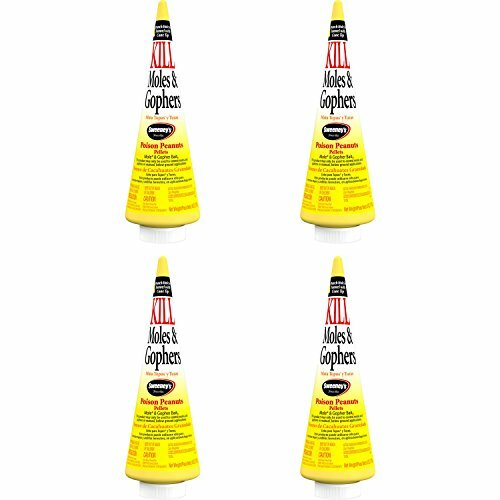 The bait in this product is moisture resistant, which means attracts and eliminates gophers in damp outdoor conditions. Or you can wet the blocks yourself if you live in a very dry climate or are experiencing a drought. We found this product to be very effective. Wear gloves every time you place bait blocks or whenever disposing of dead rodents. Bonide Moletox Mole and Gopher Killer is made with zinc phosphide at 2.0 percent and is designed to be put down burrow tunnels. When an animal eats the zinc phosphide, the acid in their stomach turns into phosphine, which is a highly toxic gas. One teaspoon is meant to treat each active burrow. We love the low price of this product and found it successful if each tunnel was treated with the poison. This rodenticide uses cracked corn as a lure which is highly attractive to animals such as gophers and moles. With a full pound of product, there is plenty to use in one teaspoon amounts in several tunnels and burrows. Be sure to wear gloves while distributing the poison and when disposing of dead rodents. Sweeney’s Mole and Gopher Poison Peanuts come in a four-pack for convenience to use through various seasons for smaller treatment areas, for use all four in larger yards. After you identify an active tunnel, this product is designed to be used as such: punch a hole in the top of any active tunnel with the pointed end of the cone (hence, the shape of the container). Then drop a teaspoon of the peanut pellets and carefully close the hole with a piece of sod or a stone. Do not collapse the path for gophers to travel again or allow any soil to cover up the bait. After two to three days, check the tunnels to determine if they are still active. Repeat this process if necessary. We found a couple of applications does the trick. Gophers can wreak havoc on yards, as a single gopher can build over 200 mounds in one year. Gophers usually live solitary lives except for mating season and while raising young. They burrow underground much like moles do and can move more than a full ton of soil in one year. You can often detect a gopher mound of disturbed soil roughly 12 to 20 inches in diameter. With moles, the mounds will usually be more circular with a “plug” more directly in the center. Gopher mounds will often be off-center with the “plug” off to one side, as well. Moles will create runs or lifted lines in the ground. Gophers, however, do not create runs. So, if you’re seeing oblong, off-centered mounds and no runs in your yard, you likely have a gopher rather than a mole problem. Gophers can wreak havoc on yards, as a single gopher can build over 200 mounds in one year. These most often occur in early spring and early autumn. While burrowing underground, they can damage wiring, rubber piping, and root plants such as carrots and potatoes. Not only can gophers damage your lawn in a big way, but they can also be a health risk. Gophers are capable of spreading hantavirus, leptospirosis, and even plague by way of fleas. They do have to potential to carry rabies, but gophers often steer clear of humans, so the risk of rabies is small. However, you should never attempt to hand-feed a gopher because of this. Before setting out bait with poisons, determine which gopher tunnels are active by either pressing down a small section of the tunnel or by removing about a one-inch section of the tunnel’s roof. Mark these sections and check them again within 24-hours. The tunnel is active if the flattened pathway has been raised up or the gopher repaired the roof. Only use poison in active tunnels to avoid using unnecessary bait in the ground where children or pets might get to it. You can denote active tunnels with small flags to keep track of areas to be treated, or that already have poison in them. Once you eradicate gophers, continue to monitor the area on a regular basis and look for signs of reinfestation. Level all existing gopher mounds after they are gone. Keeping a garden or yard tidy enough to see new mounds is important. It is so vital to check regularly for any gopher reinfestation because pocket gophers can easily move in from other areas, and these large rodents can create a lot of damage in a short time. If your lawn borders wildlands, vacant lots, or other spots that are a prime area for gophers, you can practically expect gophers to at least try to move back in regularly. If you have a particularly heavy gopher problem, keeping a decent size of bait poison on hand can be helpful in minimizing damage and prevent your property from turning into a network of tunnels.